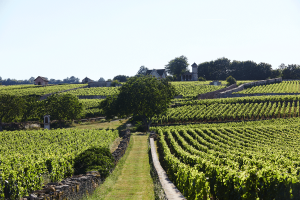 Harvest is the most celebrated time of the year in Burgundy. 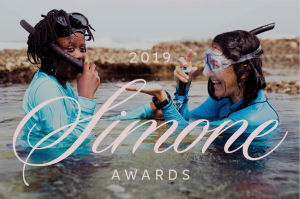 Every September, winemakers and wine lovers come together and unite over their shared passion – fine wine. 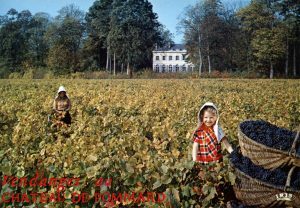 For almost three centuries, Château de Pommard has been evolving with every vintage and while today’s Harvest looks a little different from those that Vivant Micault, our founder, would have established in 1726, the principles are exactly the same. 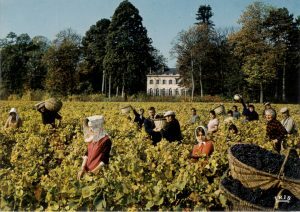 As Part One of our Harvest Through History series, and in honor of our Harvest 2017 Experience now available for reservations and kickstarting the snipping, sorting and sniffing season off in style, let’s meander down Memory Lane and take a look at Harvest through History at Château de Pommard, Clos Marey-Monge and Pommard, starting with vintage imagery from Yesteryear. 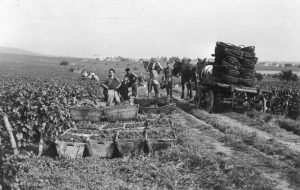 To take a look at Part Two of Harvest Through History : Yesterday click here and for Part Three, click Today. The earliest image of Château de Pommard in our archives is this watercolor from 1780. 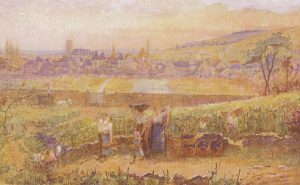 It depicts Harvesters and their grape baskets, with the earliest of foundations of the Pommard Château in the background. 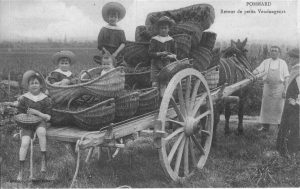 The return of the “petite vendangeurs”, complete with baby in the basket, circa 1900s. 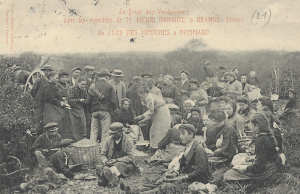 Just down the road, at Clos des Mouches, Harvesters take a break from hand-picking the grapes, circa 1910. 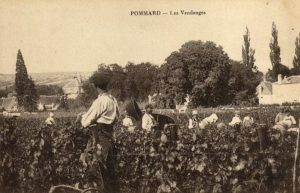 Harvesters and horses pose for photos in Pommard. Can you guess the year? 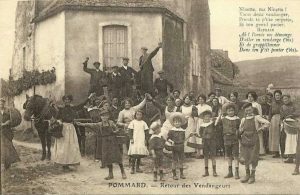 The Harvesters return to Pommard singing traditional songs. 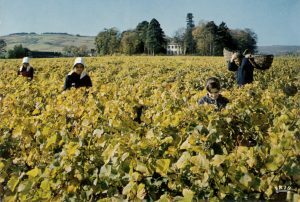 Every hand is a help when it comes to harvesting, which often made the Harvest season a very family affair, with far-flung members returning home to assist the family. With Pommard’s famous church in the background, this famous photograph shows Pommard’s harvest in full swing. The gentleman in the back, taking well-earned refreshment. 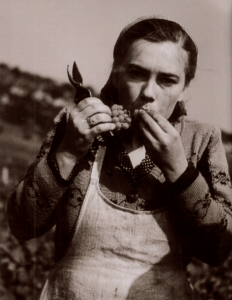 Another two famous images of Pommard grape pickers from the 1920s, enjoying the fruit of their hard labor. 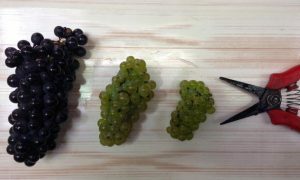 These photos were taken from behind Clos Marey-Monge up in the “Montagnes de Pommard”. 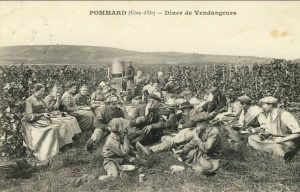 Men, women and children, believed to be associates of the Laplanche family, gather in Clos-Marey-Monge, in the plot that we now called Grand Champ (Bas) to collect grapes. Circa 1940. Mother and daughter (friends of the Laplanche family perhaps?) go treasure hunting in Chantrerie, circa 1940. 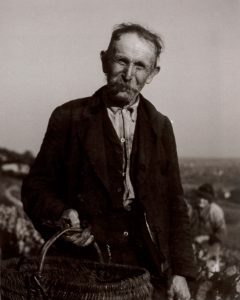 The baskets are full, circa 1940.